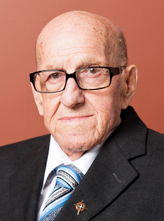 Brother Réal Lanthier, FSC, of the Francophone Canada District, died on January 17, 2015, at the District’s nursing home, in Laval (Québec), Canada. He was 96 years old. The cremains will be buried later at Notre-Dame-des-Neiges Cemetery, Montréal, in the community gravesite.